Premium black velvet Harry Potter robe is fully lined with burgundy satin andhas an embroidered patch with the Gryffindor House emblem. Join the GryffindorHouse on a Harry Potter adventure with this ankle-length costume robe fromRubies Costume Company! The robe measurement from neck to hem isapproximately: Small 35 inches, Medium 39 inches, and Large 44 inches. 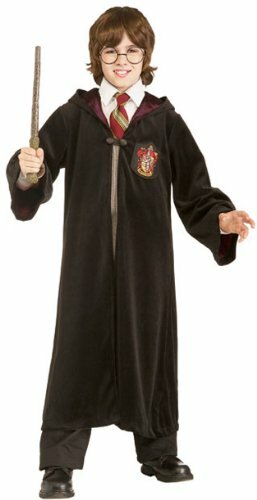 Alsolook for Slytherin robes, wands, and other officially licensed Harry Pottercostumes and accessories. For dress up play, Halloween, book reports, or justfor fun - in sizes from infant to adult - if it's magical fun you're lookingfor, Rubies has it!